It might seem obvious, but evangelical ministry is about preaching the gospel. Life transforming good news. Surely everyone agrees at that basic level? Apparently not. There is significant debate swirling about what it means to preach the gospel, not only to unbelievers, but especially to believers. 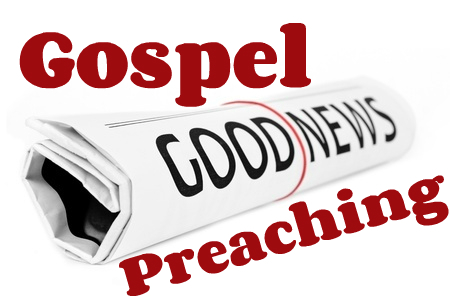 There is generally a greater degree of consensus about preaching the gospel to unbelievers. The gospel is the good news of God’s grace in Christ. It is focused on Christ’s death and resurrection, and it calls for people not to work for salvation, but to trust. By grace alone, through faith alone, in Christ alone. But there is debate, of course. Is the gospel a proclamation of what God has done in Christ, or is the gospel a call to repent and believe? Is it just semantics to argue over whether the call to repent and believe is the gospel, or whether it is the appropriate response to the gospel? I don’t think so. This is important, because it demonstrates the preacher’s underlying assumption about how humans function and how salvation functions. At Pentecost Peter stood and preached a proclamation of what God had done in Christ and the culpability of those present in their rejection of Christ (*and another ingredient that apparently has now been removed from gospel discussions – more on that later). The repent and believe element came in answer to their question of what they should do. As you read on through Acts, the preaching of the gospel is repeatedly seen to be a declaration of who God is, what he has done in Christ, that Christ is raised and so on. Repeatedly we read of sinners who turn, or repent, toward God. It is a personal and relational turn from self or from rebellion against God or from idolatrous ignorance. The repentance theme in Acts is not one associated with sinful behaviour and a turn to good behaviour. Paul makes it clear in his epistles that his preaching ministry was one of heralding Christ and him crucified. As he speaks of his preaching ministry he says a lot about his motives, his methods and his content. He proclaimed Christ and him crucified. He didn’t let his focus shift onto pressuring and controlling responses from his hearers, allowing God to generate the response rather than playing the role of ultimate persuader. As he applied the gospel to the situations in the churches to which he wrote, Paul’s focus was explicitly on Christ (*and another ingredient that seems to have been removed from gospel discussions – more on that later). The imperatives that flow out of the indicatives of gospel proclamation tend to describe what is expected of those “in Christ,” rather than an action list that loses sight of Christ as the focus shifts to self-determined effort and the hard graft of sanctification. Underlying the way we preach the gospel is our view of how humans work, the nature of sin and the nature of salvation. More tomorrow. Thank you, Peter, for helping me remember the importance of preaching the good news to the Saints. Over the past few years I’ve benefited, like so many, from Jerry Bridges’ emphasis on this angle. Your post, along with his works, helps me keep application faith-first, followed by appropriate responses to the passage. Keep up the good work. Great post, Peter. I’m looking forward to the rest. I’ve said this before, but I find it very telling and very sad that a common crossword clue is “sermon subject” and the answer is “sin”. That that should be the first thing most people think of tells us that our emphasis is wrong. I hope many will read your posts on this and really question what we do and why. I believe that, introducing Christ & what God has done through Him should be the true aim of the Gospel just as paul’s revelation reveals. Once people’s attention is drawn towards Christ, then we trust the Holy Spirit to complete the work of total transformation in that person. Not to keep preaching repentance, for repentance is to the jews, while remittance of sin has been made to the sinner. Thanks for this. Repentance will be the response of someone captured by Christ. If we emphasize it we can sound like we are taking on the responsibility to convince, but we do have to be careful not to be misunderstood as preaching a “repentance-free” message that is pro-sin.